In this and intimate memoir, an acclaimed journalist reflects on her childhood in the heartland, growing up in an increasingly isolated meditation community in the 1980s and ’90s—a fascinating, disturbing look at a fringe culture and its true believers. When Claire Hoffman is five-years-old, her mother informs her and her seven-year-old brother Stacey, that they are going to heaven—Iowa—to live in Maharishi’s national headquarters for Heaven on Earth. For Claire’s mother, Transcendental Meditation—the Maharishi’s method of meditation and his approach to living the fullest possible life—was a salvo that promised world peace and enlightenment . At first this secluded utopia offers warmth and support, and makes these outsiders feel calm, secure, and connected to the world. Claire attends the Maharishi school, where her meditations were graded and she and her class learned Maharishi's principals for living. But as Claire and Stacey mature, their adolescent skepticism kicks in, drawing them away from the community and into delinquency and drugs. Eventually, Claire moves to California with her father and breaks from Maharishi completely. A decade later, after making a name for herself in journalism and starting a family, she begins to feel exhausted by cynicism and anxiety. She finds herself longing for the sparkle filled, belief fueled Utopian days in Iowa, meditating around the clock. So she returns to her hometown in pursuit of TM’s highest form of meditation — levitation. This journey will transform ideas about her childhood, family, and spirituality. 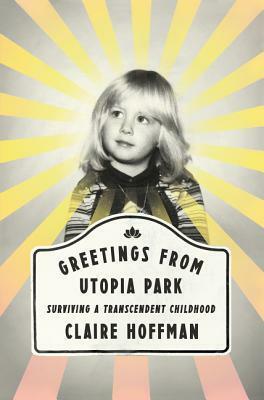 Greetings from Utopia Park takes us deep into this complex, unusual world, illuminating its joys and comforts, and its disturbing problems. While there is no utopia on earth, Hoffman reveals, there are noble goals worth striving for: believing in belief, inner peace, and a firm understanding that there is a larger fabric of the universe to which we all belong. No problems to report here - the writing is just fine. I'm not ready to go for exceptional, but it's good memoir writing. The author does a great job of introducing us to her family and what makes them tick and of making us feel like we're a part of her childhood. It's done well, but there's nothing about the writing that made it stand out to me as exceptionally good either. This is the hardest part of a memoir for me to critique, because I'm giving an evaluation of a real person's actual life. No one wants to say whether or not they find another person's most personal thoughts and stories interesting. That said, I didn't enjoy this one as much as I had hoped I would. It's not that Hoffman doesn't have an interesting life, it's just that I couldn't help but compare it to past reads about cults and Transcendental Meditation (specifically Hell-Bent by Benjamin Lorr and A Death on Diamond Mountain by Scott Carney). Were I not reviewing the book for the blog, I honestly can't say that I would have finished it. There's nothing at all wrong with the writing or the quality of the book in general - I'm just not sure that, for me, it's a book that merits being a memoir. It's an interesting childhood and adolescence, but something in it just didn't click for me the way I expected it to. I'd recommend it to those who have a particular interest in the subject, but I'm not sure I'd pass it on to the casual memoir reader. Thanks to TLC for having me on the tour. Click here to see the rest of the stops, where you can find other reviews to be posted in the next few weeks!